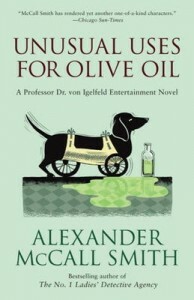 In a sensible world where we all worry about relationships and how to fix them, it is a relief – and a joy – to read Alexander McCall Smith – especially when he’s writing about his German professors who get into situations beyond imagining but hilarious all the way. One of these men is Professor Dr. Moritz-Maria von Igelfeld. He wrote the definitive text book Portuguese Irregular Verbs for the Institute of Romance Philology. He is married to the book, although his friends try to persuade him otherwise, and spends every waking hour assuring his own name receives the recognition he feels it deserves. This results in some amazing adventures, including one trip on the annual student body retreat in the Alps. He plunges 3,000 feet – to make mountaineering history – and later turns this into a lecture series. McCall Smith has lived in Africa, England, Scotland and written from all of them. One of the earliest and most beloved is The No. l Ladies Detective Agency. Readers in Ottawa may have caught Alexander McCall Smith on a recent visit here where he spoke to the Authors Association. A questioner in the audience asked McCall Smith why he ignored all the trouble in Africa when he was writing about that continent. He replied firmly that yes there was trouble, but there was another aspect to life, and that he is what he chose to write about. He certainly does it in Unusual Uses for Olive Oil. The result is a very funny book.